Scrap batting made into a flower. We hope everyone had a fabulous relaxing summer and stayed cool! Now that the kiddies are back in school and the holidays are just around the corner ( Uggg so soon right?) we are certain you are going to be busy bees quilting and crafting away. Keep in mind we are always here to help you with your batting questions and needs. Please call us for samples of our batting to try! We will be more than happy to send you some and a user’s guide to go along with it. We will also be glad to help you with goodies (mini samples) to put in gift bags for grand openings, guild meetings or shop hops! Give us a shout and we’ll help ya out! Thank you for your support.We truly appreciate it! Living in Virginia Beach, there are a number of church festivals and markets running almost every weekend where booths or tents are set up offering handmade wares. My favorites, of course, are those offering quilts! Most times, these would not be considered show quilts – instead they are quilts made for snuggling, swaddling, and cuddling. With permission, I can’t help but reach out to touch the corners as I scan the piecing styles and beautiful fabrics. At these events, I get a bit of fun out of guessing what type of batting is in each quilt, and I am always thrilled to find that one of our battings has been used. “Oh, how drapey – did you use Quilters Dream Cotton?” I ask, or “This must be Quilters Dream Wool.” The smiling sweet ladies sitting behind the tables confirm my guesses and always tell the quilts’ stories. Each quilt, of course, has its own unique story of how it was made and what events happened during its creation. After sharing that I work for Quilters Dream Batting, I have heard numerous stories about battings of the past. There are those whose mothers made them separate the fresh picked cotton from the seeds and those who used whatever was on hand from old scratchy military blankets to pieces of flannel nightgowns or even older ragged quilts. Battings have come a long way. We are certainly living in an extraordinary time when the unique talents and gifts of traditional (and modern) quilting come together with the very latest in fine batting fibers and the best processing to make even the humblest quilt a real treasure that will last a lifetime. I do not have a long arm machine, so floating a quilt top does not pertain to me, but some information is just too good not to share. Briefly, to “float the top” means to not pin it to the leaders. To float a top, attach the backing as usual, then lay the batting on the backing and baste it to the backing to give a straight line. Pin the top to the batting, smooth out the top, and allow the bottom to float (hang) free. You can now lift it to smooth out the batting. Quilt as usual, smoothing it as you go and making sure the edges stay parallel and at the same width as you started. “I pin the backing onto the take-up roller and the canvas for the backing under the frame table. I roll it up evenly. I lay the batting on top of the backing, right along the top edge – I don’t see any reason to start down 2-3”. I place a pin about every 9” or so along the top, perpendicular to the canvas, making sure it is smoothed out. I baste the batting to the backing – I start on the left side, about 2” down from the batting edge. I turn on the channel lock, turn up my speed to 30, and run a stitch along the backing/batting. I push the machine with my left hand, rather quickly so the stitches are very large. With my right hand, I’m pressing down on the batting just ahead of the machine so no pleats occur. This basting line gives me a straight line to now pin my top on. I also figured out what to do with the canvas leader underneath that I used to pin the top to – I tied the end up to the under part of the frame, so I have a “cradle” for me to put the batting and top into as I’m working, and they’re not just laying on the floor. If you have any pictures of your personal experience with “Floating the top” please share them with us. When Virginia Beach resident Kathy Thompson decided to raise awareness and research funds to help find a cure for ALS (Amyotrophic Lateral Sclerosis), also known as Lou Gehrig’s disease, she knew quilters would embrace the challenge. As the co-founder and owner of Quilter’s Dream BattingÒ, a Virginia Beach based business that manufactures high quality quilt batting; Kathy knows how generous and caring the quilt community is. What she didn’t know was how much they would touch her life and the lives of thousands of individuals living with ALS, including her own son. I will never understand why people keep looking for alternative natural fibers for quilting - you can’t get much more environmentally friendly than cotton. 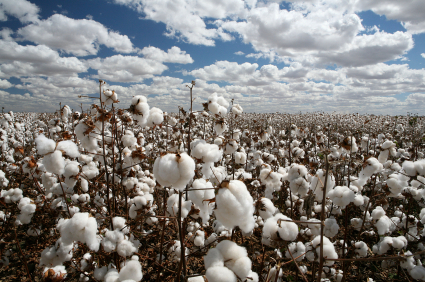 Cotton is a renewable resource that has stood the test of time – cotton fabrics have been found in ancient tombs that are thousands of years old. Not only is cotton an eco-friendly fiber, but the cotton used in Dream Cotton is grown and processed in the U.S.A.! If you have ever had a quilt beard, you know how frustrating and heart-wrenching it can be. Once that soft, wonderful batting is in the quilt, the last thing you want is to see little bits of it appear on the top. Bearding gets its name because back when poly fiber was stiff and horrible (think leisure suit) the fibers would poke through the fabric and then grow like an old man’s scruffy beard. Today’s Quilters Dream Batting fibers, even the poly fibers, are fine, thin, long, and soft, and naturally resist bearding. However, on the rare occasion given the wrong conditions, even the highest quality batting can sometimes beard. Who doesn’t complain about how much fabric his wife may buy. Because on this subject his wife can get to be quite a bore. Because it’s likely that’s the one she’ll need to fill her design gap. And he’s learned there’s not just red, but brick, rust, scarlet and crimson. Cuz in HER house there’s only personally designed quilts instead. And at a quilt show there’ll be lots of scribbling and gawkin’. That can only be controlled by regular doses of stitchin’. Cuz she does quilts that are traditional, modern and some just plain funny! He’s always been interested, supportive, patient, and very, very dear. 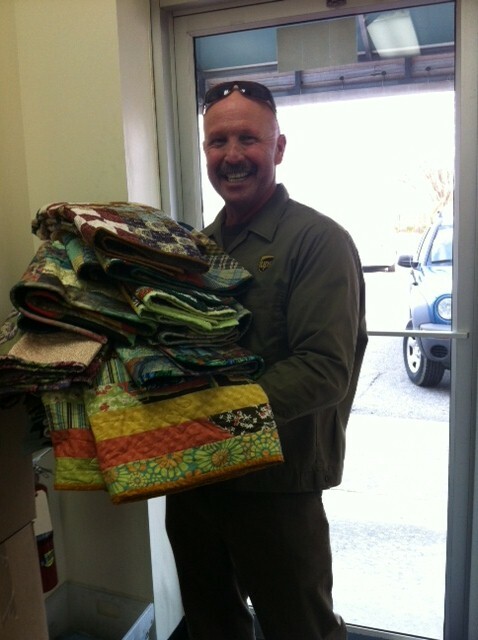 · Save time and energy by just going to the quilt shop to get the quality fabric and supplies you want. 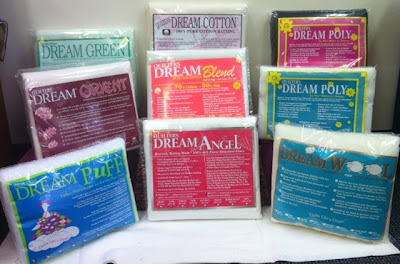 They are far more knowledgeable, helpful, and friendlier than discount stores, with better quality supplies, to boot (including Quilters Dream Batting, which is not sold in discount stores). They even gave me snacks while we visited- thank you Sarah’s Thimble! · If you have young children, you may need a locked safe to keep all your fabric pieces out of their hands. · Don’t even bother putting away the ironing board. · Buy three times as many pins as you think you will need, and there is a slight possibility that you will have enough. 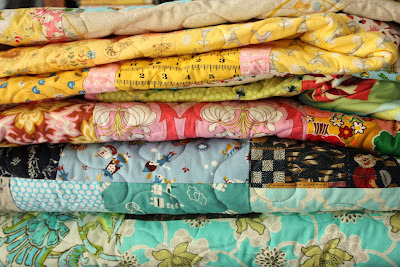 · Don’t leave the half pinned quilt on the dining room table with a cat in the house or it stands a good chance of getting a furball left on it. · If you tell a three year old to keep his snacks away from the half finished quilt, it will end up with a piece of American cheese stuck to it. · Don’t leave the binding to finish the day before it needs to be done, or you may just have to bind while suffering from strep throat. 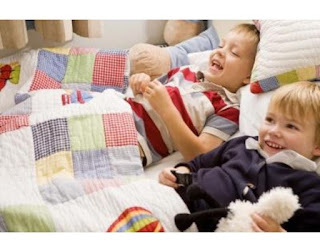 · The big hug and sincere “Thank you – I will keep it forever” you get when giving the quilt to a college bound graduate is well worth the effort!